Kelloggs brand Pringles unveiled its Merry Pringles Tree installation during an event at Spinningfields in Manchester last night (12 November). 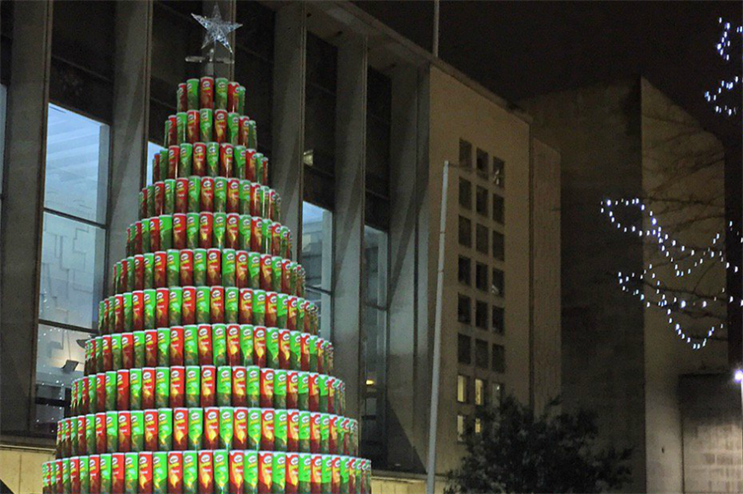 The green and red-coloured tree, which also popped up within the centre last Christmas, is comprised of 1,600 Sour Cream & Onion and Original Salted Pringles cans – the equivalent of 144,000 crisps. This year the tree is also accompanied by the Pringles Advent Calendar, which was unveiled by Capital FM Manchester presenter, Wingman. Each day between 1-24 December a new door of the calendar will be unlocked to reveal prizes including Pringles products and vouchers, or gifts donated by businesses situated within Spinningfields. To be in with a chance to win, members of the public are being asked to capture a selfie by the tree and post it to social media using the hashtag #MerryPringlesTree. Daily winners will be picked at random. The event was also attended by Pringles ambassador Mr P, who was on hand to greet the crowd, as well as carol singers. The Merry Pringles Tree will be positioned within Spinningfields' Crown Square until 3 January 2016.